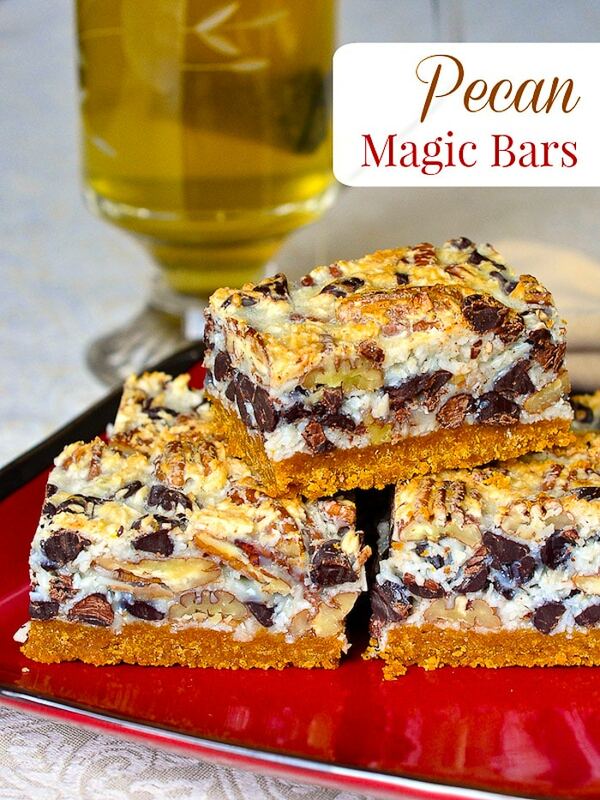 Pecan Magic Bars - a foolproof classic cookie bar! 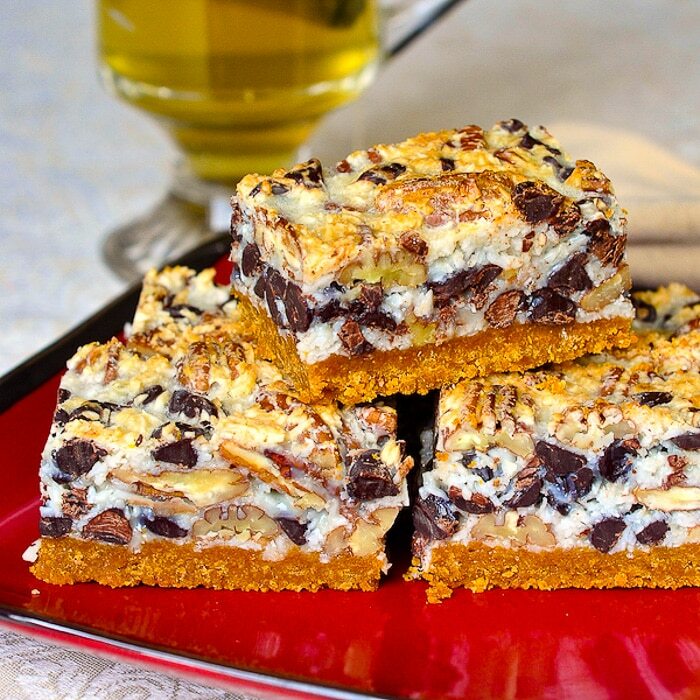 Pecan Magic Bars. A classic, super easy, chewy, nutty, chocolatey cookie bar that’s practically foolproof for even the most novice baker and they freeze exceptionally well too. Seasoned bakers will almost immediately recognize these simple cookie bars but many will disagree on the name, magic bars. The truth is, this recipe has been around for many, many years. I remember making them well over 30 years ago when the recipe was given to my Mom under the moniker “Christmas Squares”. Not a particularly descriptive name but I have since seen them as Layer Bars, Seven Layer Bars, Magic Bars, Walnut Coconut Bars and I’m sure many more. 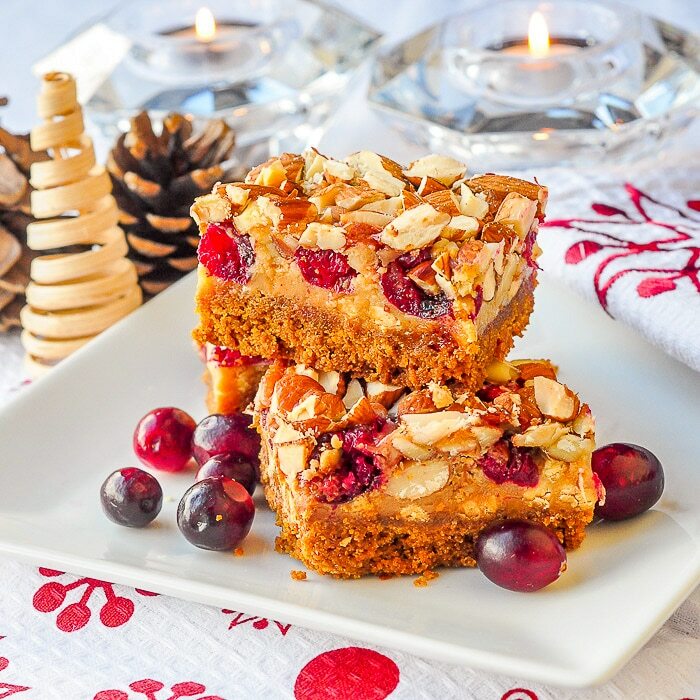 No matter the name, these delectable cookie bars might be the easiest ever to make. My reason for posting this recipe is simply that I like to bake them in a smaller pan than most recipes indicate. I found that because of the high sugar content these bars were too thin in a 9×13 inch pan and could very easily over-bake and be somewhat brittle. I prefer to mix all of the ingredients together rather than putting them down in layers and I bake them in a 9×9 pan so that they are thicker and always bake to a chewy texture. It is a matter of preference, I suppose but I’ve always had better success using this method. If you like you can still bake them in the larger pan, just decrease the baking time and watch them closely. Don’t let the top get as browned as shown in the photo or they will likely be over-baked. We also like a thicker graham crumb base on our cookie bars and have modified the recipe to increase the base a little. Most traditional recipes also call for walnuts but over the years our family’s preference has changed and we now think pecans are better in this recipe but you can substitute any nut you like. Updated recipe. Originally published April 18, 2013. 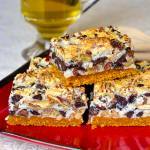 Like this Pecan Magic Bars recipe? Be sure to browse the photo index of over 200 cookie and cookie bar recipes is in our expansive Cookies Category. 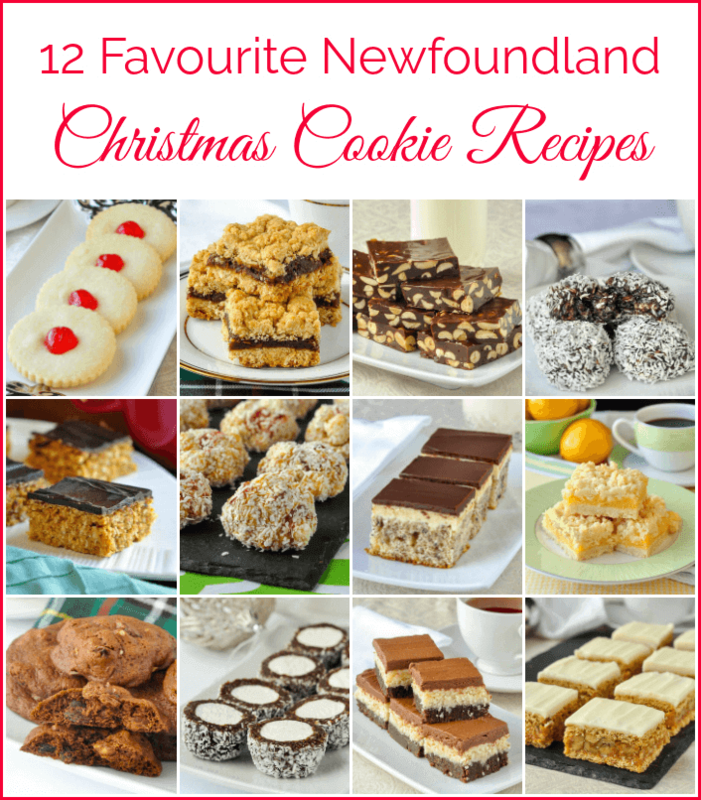 You might also like to try some of our very popular recipes in our Best Newfoundland Christmas Cookies Collection. Pecan Magic Bars - a classic, super easy, chewy, nutty, chocolatey cookie bar that's practically foolproof for even the most novice baker and they freeze exceptionally well too. Preheat oven to 350 degrees F. Lightly grease a 9x9 inch baking pan and line with parchment paper. Mix together the graham crumbs butter and sugar. Press evenly into the bottom of the pan. Mix together all of the ingredients for the top layer well. Pour evenly over the prepared base and bake for 30-40 minutes or until light golden brown on top. Cool completely before cutting into squares or bars. These freeze particularly well. I’ve always wanted to make magic bars, or something similar, I love chewy gooey bar cookies! I was wondering if I was too omitt the coconut, should I add extra nuts, or do you think leaving it out will effect the texture, maybe making them too dry?